Amogapasha (Skt) or Donyod Shakpa (Tib) is a form of four-armed Chenrezig, Avalokitesvara, that has been practiced throughout the Buddhist world for more than a thousand years. Amogapasha represents a highly active form of compassionate energy designed to rescue beings from very negative and destructive states of experience. The great treasure master of our time, His Holiness Orgyen Kusum Lingpa, whose enlightened intention and activity were beyond our ability to fathom, revealed a number of practices of this deity that he received personally in his past life as the heart disciple Lalung Paldor from Guru Rinpoche, including special rituals for the deceased, and daily sadhana meditation practices of varying lengths. 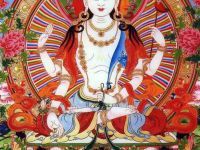 The practice could be described as the Maha of Ati, or the Ati of Maha: meditation on the deity generated from, displayed within, and resolved back into the expanse of rigpa awareness, free of any contrivance or dualistic view. Tulku Sherdor offered a thorough transmission and instruction on this deity practice in Boulder, CO in October 2012, as part of his mission to spread the Mahayana dharma as widely as possible. This set of talks is highly recommended for all those who have received transmission for this practice elsewhere, to deepen understanding of sadhana and visualization practice in general, and the dzogchen approach to deity yoga in particular. With such transmission and instruction, you will also be welcome to join our regular online Amoghapasa practice and teaching sessions with Tulku Sherdor. Another live program for those new to this practice will be scheduled in 2013.